Andras, I know that you are a co-founder of a company that makes digital products and services, using Kotlin on backend and Android. Tell us how you became a community organizer of Kotlin enthusiasts on top of that. Sure. We've been building Android apps for quite some time and started experimenting with Kotlin in 2013. We immediately became fans. There was little community activity around Kotlin in Hungary, and we decided to change that. Budapest Kotlin UG was founded in 2017 and we meet on an average every 2 months. Depending on the content and weather (laugh), we have 25 - 40 attendees on a regular basis. Can you share some information on what the developer ecosystem looks like in Hungary? Is it typical for local IT companies to be involved in community activity as well? I would say the IT industry is pretty developed and growing (it currently accounts for 4% of the total corporate revenues in the national economy). There are numerous tech startups that are active in the meetup and conference scene. It’s quite common for IT companies to offer their meeting rooms for community meetups for free. What does a typical meetup look like for you? We meet in the evening after work, starting with a quick introduction of the meetup agenda. Then we have 2-3 speakers presenting and answering questions. My favourite part is the informal discussion afterwards; you get a lot of insight when people start chatting about their experience with Kotlin and issues they’re facing. Has being an organizer helped your personal and professional development? For sure. It helps both socially and professionally. It takes a lot of effort to organize a meetup or a conference, but in the end, it is very much worth it. I always learn a lot and meet fantastic people on the way. If I give a talk, I need to be competent in the topic I’m talking about, not to mention the public speaking skills training I get. Listening to other speakers is a great learning opportunity for me. How do you find speakers for your meetups? We advertise on our Facebook and Meetup.com page (and also during our actual meetups) that we’re offering anyone who feels confident to talk an opportunity to speak. If someone raises an issue or a problem during any of the informal discussions, I always ask them if they would talk about it in the next meetup. For our Kotlin conference, we had a more formal approach - we announced a ‘call for speakers’ 3 months before the event to get the papers in. How did the Kotliners conference come about? We wanted to create more awareness about Kotlin. Don’t get me wrong, regular meetups are great, but we thought to ourselves “let’s do something bigger.” We had support directly from Jetbrains and Google and that helped a lot. We mapped everything out, and organizing a conference looked feasible. However, we were unaware how much work it would be to actually do it (laugh). It all worked out in the end. We received an overall positive feedback from the attendees (you can read a detailed recap that includes videos from the presentations on our blog). They appreciated both the technical content as well as the social aspect of spending time together. We made sure to include enough socializing opportunities and hosted our after party in one of the famous Budapest ruin bars (the bars are located in old buildings that are in ramshackle conditions, thus the name “ruin bar”). We also deliberately chose Friday as the main conference day to allow participants to spend the weekend in Budapest. It was a risk, but Budapest in the summer is a popular tourist destination and I think it worked out. It seems like there was a lot of great energy around the event. Tell us a bit more how you thought about the content and structure of the day. 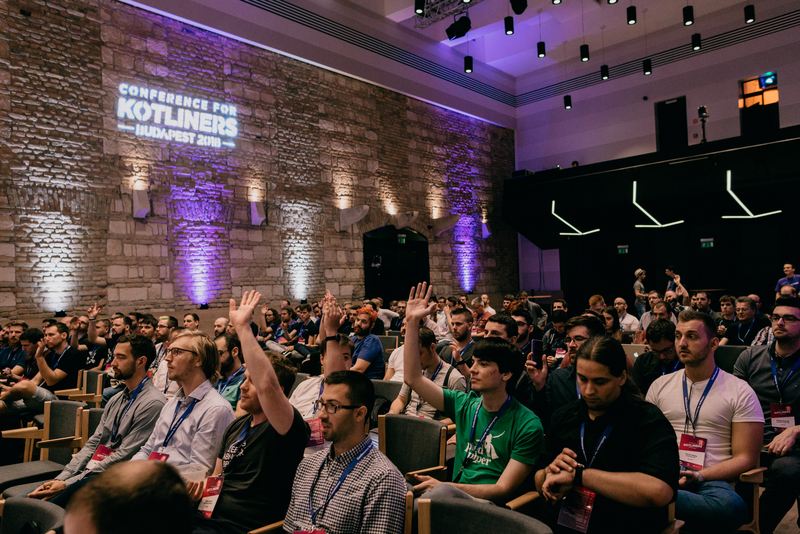 We wanted to have a general Kotlin conference without focusing too much on anything specific (Kotlin is used for a lot of platforms, but we wanted to focus on the language itself). We had 1 track of presentations delivered by 8 great speakers (GDEs, Jetbrains experts and other speakers). Our venue was a big win as well - Budapest Music Center not only has a great acoustics, but being located downtown, it overlooks the river Danube and offers some amazing views. You mentioned that you underestimated the organizational workload of the event a bit. How many organizers are there at Kotlin Budapest UG and how do you split the organizational tasks? Well, I think our situation is a bit unique as the community is nested under our company. That means that everyone from the team contributes with ideas and helps out with what needs to be done. It happens quite organically. We’re a core team of 4 and it works for now. Even though we’re not actively looking for other organizers, we’re open to include anyone who would be interested. What does the near future of Kotlin Budapest UG look like? We want to build on the momentum that Kotlin now has. More and more people are interested to learn and use the language. We see more people coming to our meetups. We might be looking for a bigger meetup venue soon (laugh). I’m already excited about Kotliners conference in 2019. If anyone is interested to blog about Kotlin or talk at one of our meetups, let me know and we can talk about posting on our blog.